Digging Esri T-shirts in Thailand! 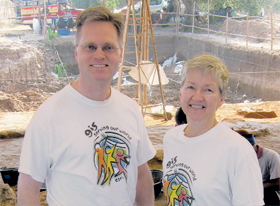 Brian Hall, GIS analyst for the Washington Department of Fish and Wildlife, and Kathryn Scott of Washington State Parks volunteered at an archaeological dig near Phimai, Thailand . . . and remembered to take their matching Esri T-shirts halfway around the world!